Complementosparaaves.com was born in 2014 and constitutes the generic name of a Web page that arose from a set of common ideas of two of the sectors that we love, the pharmacist and the veterinary. Its main objective is to give a professionalism not previously found to breeders and pet lovers, as we are. Our pet launch was in the 2015, but it is in this year 2016 when our great growth in the online market has occurred. At this time in Complementosparaaves.com we intend to expand outside Spain and be a leader in Europe, and continue advancing, innovating and offering new products and services. Currently we offer more than 5000 references related to pets, we manage numerous daily orders from our logistic center and we anticipate closing the year with an increase of 400%. 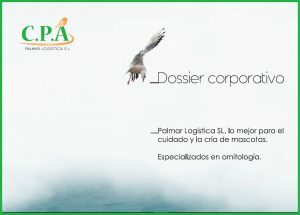 To learn more about our company you can see and/or download our corporate dossier.